After over a decade, policies relying on high stakes testing as a means to drive more effective teaching specifically and a better education generally have become embedded in public education.Fullan (2014) says we have gotten it all wrong. 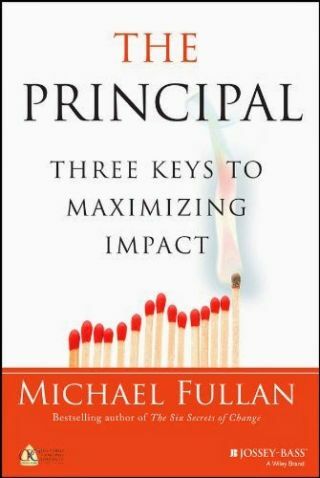 In his book, The Principal: Three Keys to Maximizing Impact, Fullan points out that these federal initiatives have failed to bring about extensive instructional change because they use the wrong policy drivers to try to change education. In other words, we simply aren’t getting the kinds of change we want in education because we are focusing on the wrong things to make that change happen. What should we be doing to maximize impact on schools? According to Fullan, we need to “reposition the role of the principal as overall instructional leader so that it maximizes the learning of all teachers and in turn all students” (p. 6). To do this, Fullan indicates we need to focus on three key aspects of the principal’s role: 1) Leading Learning, 2) Being a District and Team Player, and 3) Becoming a Change Agent.